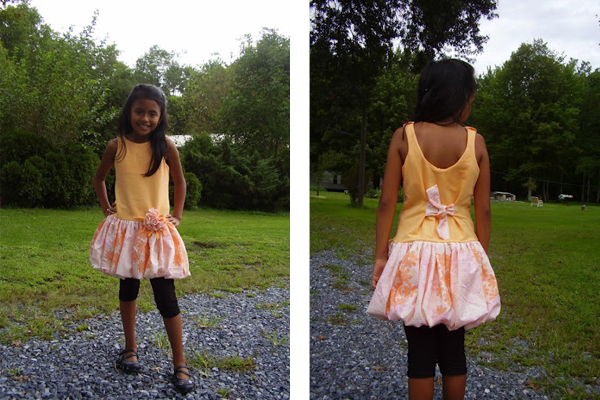 Fabric Mart Fabricistas: Made by a Fabricista: A Little French Terry Dress. Made by a Fabricista: A Little French Terry Dress. Working at Fabric Mart is rewarding in many aspects. Inspiration fills you when you are around so many fabrics. 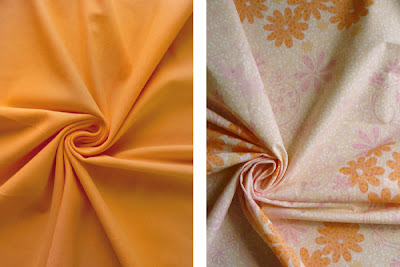 The colors, patterns and other characteristics of the fabrics take me to a world of imagination. One of many the afternoons sitting at my desk in front of bolts of fabrics waiting for me to take them one by one and determine their information to describe them for the website, I suddenly pictured a dress made out of the two fabrics that Brett had put together on the table. Sometimes I feel like he is doing it on purpose! I stopped describing and just had to run to my boss and ask her "Julie, may I sew a dress with two of the new children fabrics that came today?" She did not hesitate, "Sure! Whatever you need to do!" Immediately I grabbed my best friends: scissors, a ruler and a piece of paper. I drew a sketch and took the bolts to cut the pieces I needed. Very sleek as if I were doing something wrong I drew the patterns on the fabric and cut them using a pen and pins. If I would have had a sewing machine there I bet I would have sewn it! I went home that Friday with my pieces and put them together. The sewing machine did not want to work, the thread on the opposite side was getting messy and loopy. I followed Julie's advice: to follow instructions of the sewing machine manual but that didn't work either. And then I was reminded of my mother when I was five years old and she was sewing all night long one night, I woke up and saw her sewing with paper underneath the fabric, I thought it was one of her many inventions. So that day I tried with paper and it worked. For the flower I cut circles folded them in half and found the radius. While holding the center with one hand I gathered from one edge to the other. I hand sewed each and made many more of those until I had enough for the fluffy flower. I love how French Terry and Jerseys curl up so I took some of those curls and used them as decor for my flower. Taken from the New Children's Collection of Fabrics introduced two weeks ago in the new arrivals of our website. French Terry is a Cotton Knit that allows skin to breath and is very confortable and especially soft to wear against the skin. For that reason the dress is lined in all French Terry and the Ballon Skirt is made out Poplin that being crispy holds its shape and body. This crispness was also suitable for the floral decoration. I finished this cute dress at 11:30 pm. in between helping my daughter, doing dinner, feeding the dogs and cat and weeding. But I enjoyed sewing that day. I hope you all like it and enjoy the New Children's Collection. Tags: Made by a Fabricista. Hi - I'm curious - did sewing with paper underneath help keep the machine from eating the fabric? The last time I sewed with a knit - the machine kept pulling the fabric into the bobbin hole (sorry, don't know what else to call it) and it was tricky to say the least. Would sewing with newspaper prevent that? Yes. Gabby used the paper because her bobbin thread was knotting when the fabric was not being guided very well by the feed dogs. Using the paper prevents the fabric from getting stuck and allows the feed dogs to move it easily. good post, so cute dress, thanks for sharing. 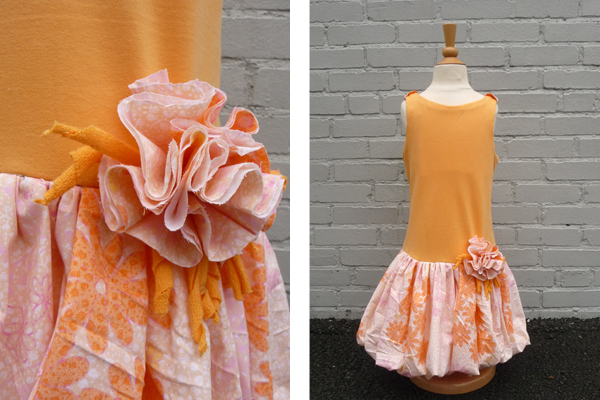 Fan Feature: Margy from Fool 4 Fabric. Fan Feature: Pretty in Pink Sewing Room. Inspiration: More Sewing Room Jealousy! On the Road: DG Expo in NYC.